The creation of a permanent, official memorial to honor the memory of Westchester County Firefighters who paid the ultimate sacrifice, became a reality on Oct. 13, 1991. The memorial stands as an enduring tribute to those firefighters of Westchester County to whom we all owe immeasurable gratitude. 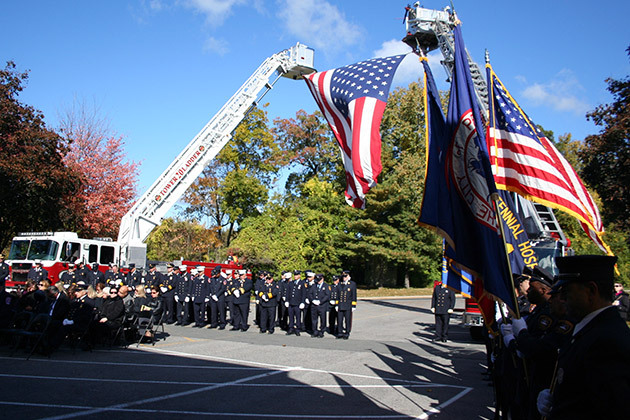 As part of honoring these firefighters, a memorial service is held annually in October, in which every Westchester County Fire Service Agency, Association and Organization, as well as the fallen’ s surviving family members are invited to attend and participate. 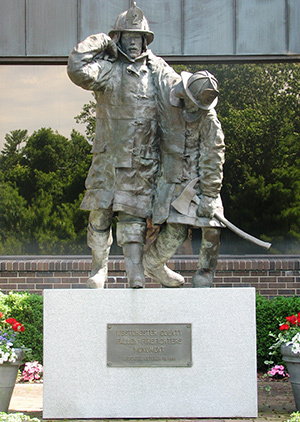 sized bronze statue depicting a firefighter assisting a fallen comrade to safety. Surrounding the statue on the brick walls of the training center are bronze plaques, containing the fallen’s name, department and date of sacrifice. The Westchester County Fallen Firefighters Memorial Committee is currently accepting nomination applications.